I am deeply grieved in my heart to write this post as I am most assuredly certain I will not only suffer the cost of exposing a man who is considered by many to be orthodox and thoroughly Reformed, but I anticipate that I will also suffer the loss of friendships as the same man is loved by the masses of Christian young people everywhere. It goes without saying that John Piper is a very noteworthy man. John Piper was the senior pastor of Bethlehem Baptist Church in Minneapolis, Minnesota from 1980 to 2013. During his ministry at Bethlehem, Piper authored 50 books and contributed to the formation of numerous resources. Since stepping down from the senior pastorate, Piper works to minister on a global scale through the desiringGod ministry. In addition, Piper currently serves as the chancellor of Bethlehem College and Seminary. Regarding education, Piper has completed his undergraduate at Wheaton College where he majored in Literature and minored in Philosophy. Piper continued his education at Fuller Seminary where he was awarded the Master of Divinity and completed his doctoral work at the University of Munich. The mention of Piper’s accomplishments is for the purpose of bringing to one’s understanding the depth of respect that is owed for the body of work Piper has achieved. The impetus of Piper’s work rests largely upon the foundation of his most notable book Desiring God: Meditations of a Christian Hedonist. This author’s copy of Desiring God also includes on the front cover the recommendation/affirmation of another accomplished pastor, John MacArthur. Furthermore, on the back cover, additional words of affirmation from pastor/teachers such as R.C. Sproul, Larry Crabb, and Jerry Bridges appear. For example, MacArthur writes, “A soul-stirring celebration of the pleasures of God…A must read for every Christian and a feast for the spiritually hungry.” The question that must be raised by anyone who reads such an affirming statement as MacArthur’s is, ‘Is the statement true?’ This author has sought to answer the question by taking a systematic theological approach to evaluating Piper’s book. As a result, what has been uncovered is shocking. Before beginning the systematic evaluation of the book, a comment about the introductory portion of Desiring God is necessary. Rarely should an introduction be read before one reads the body of a book; so that both author and reader come together to a common ground. On the other hand, there are times when introductions are necessary to read as they may inform the reader about the author and may provide insight to how the author was motivated regarding the content and formatting of the book. Piper’s book is no exception and the introduction is quite troubling. Furthermore, when it comes to the Bible, a higher form of careful consideration and critique of Desiring God is necessary because of the dangers that lurk in the present day with false teachers. Since Desiring God is a book claiming to be based on the Bible, one ought to look at Piper’s introduction for the purpose of establishing principles of engagement. Therefore, the following rules will be explained and utilized in the evaluation of the book. Several posts will flow out of this foundational post as each area of theology requires its own post as Piper’s book is compared to Scripture. The first principle, Piper openly admits he wrote Desiring God “to be a philosophy of life that he believes is biblical” (23-24). Piper’s statement is crucial to the cautious Christian reader as there is a strong warning from Scripture regarding the dangers of philosophy. Furthermore, can one trust what a man believes to be true and therefore read his book without a critical eye? The Apostle Paul writes, “See to it that no one takes you captive by philosophy and empty deceit, according to human tradition, according to the elemental spirits of the world, and not according to Christ” (Col 2:8). Christ stated to the Apostles regarding the end times, “See to it that no one leads you astray. For many will come in my name, saying, ‘I am the Christ,’ and they will lead many astray…And many false prophets will arise and lead many astray. And because lawlessness will be increased, the love of many will grow cold” (Matt 24:4-12). “But false prophets also rose among the people, just as there will be false teachers among you, who will secretly bring in destructive heresies” (2:1). As Peter noted, Christians are to be on the lookout for false teachers. Furthermore, Peter provided insight into the modus operandi of the false teacher. The false teacher introduces destructive heresies. The word “heresies” can be translated as opinions. The main idea from 2 Peter 2:1 is that false teachers bring in opinions that do not accord with Scripture. Such opinions deviate from the unified nature of biblical doctrines. In other words, heresies may agree with one doctrine of Scripture; but, the biblical requirement is that in order for a matter of opinion to be biblically true, it must be unified with all the doctrines of Scripture. No contradictions can exist. Keep that in mind as it will be a principle utilized in the evaluation of the book. Second principle, Piper asserted “In short, I am a Christian Hedonist not for any philosophical or theoretical reason, but because God commands it (though He doesn’t command you to use these labels! )” (25). 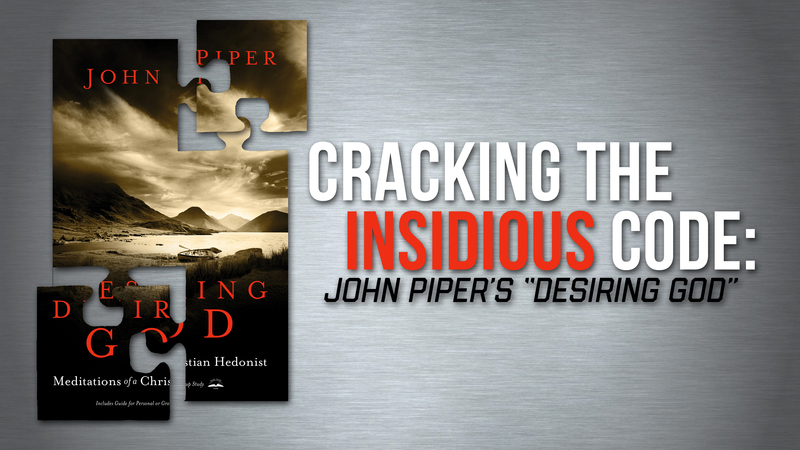 While it seems that Piper contradicts himself in the introduction, it would be a good idea to ask the question, does God command believers to be a Christian Hedonist? To abide in Christ is to abide in His word, the teachings of Christ (John 8:31). The words of Christ are clear and understandable to the common man. A 300-page book on a topic such as Christian Hedonism raises questions as to its origin. Is Christian Hedonism from God or Satan? Well, Piper openly states, “Many objections rise in people’s minds when they hear me talk this way” (24). Rightfully so, objections should be raised in people’s minds, especially in the discerning Christian. “Fresh ways of looking at the world…do not lend themselves to simple definitions. A whole book is needed so people can begin to catch on…I would prefer to reserve a definition of Christians Hedonism until the end of the book when misunderstandings would have been swept away”(27). Piper’s main thesis is “God is most glorified in us when we are most satisfied in Him” (288). Naturally, a critical reader should ask the most basic question, ‘Is the thesis supported by the Bible in its raw and unexplained form?’ Is the basic statement true? In this case, the answer is a resounding no! Therefore, the next principle to be employed is to be on guard as the main thesis of the book is contrary to the Bible and the author does not want the reader to understand the contradictions that reside in his book; rather, he wants the reader to accept them. “Quick and superficial judgments will almost certainly be wrong. Beware of conjecture about what lies in the pages of this book! The surmise that here we have another spin-off from modern man’s enslavement to the centrality of himself will be very wide of the mark”(27). According to an old tale, the Grand Vizier Sissa Ben Dahir was granted a boon for having invented chess for the Indian King, Shirham. “And is that all you wish, Sissa, you fool?” exclaimed the astonished King. Simply stated, Piper’s argumentation works by asking of his reader to at first give up a little grain of truth in chapter one and then to give two grains of truth in chapter two and so on until the end of the book. By the time the reader arrives at the end, he has given up more truth to Piper than he has realized. In fact, the reader has left the boundaries of Scripture and can no longer discern truth from error. This is exactly what Peter says false teachers do; namely, false teachers mislead by sensuality (2 Peter 2:2). The term sensuality is best understood not as immorality but as self-abandonment. In a nutshell, self-abandonment is the violation of God’s boundaries both spiritually and naturally. This is exactly where Piper’s book leads. In the next post, an examination of the doctrine of God’s Love found in the Bible will judge the doctrine of God’s Love as explained in Piper’s book. Please stay on the lookout for the upcoming posts. Minor edit for clarity by admin.